Los Angeles, CA - There's a brand new full-length film in the ever-popular My Little Pony canon. Following a theatrical run in the fall of 2014, where the film opened with enthusiastic reviews to packed crowds in over 400 theaters, My Little Pony Equestria Girls: Rainbow Rocks will be released October 28 in the U.S. and Canada from Shout! Factory Kids, in collaboration with Hasbro Studios, as a single-disc DVD, and in a Blu-ray/DVD/Digital Copy combo. Bonus features include an Audio Commentary, 8 Prequel Shorts and Sing-Alongs. In My Little Pony Equestria Girls, released in fall 2013, Twilight Sparkle's crown was stolen from the Crystal Empire, and she pursued the thief, Sunset Shimmer, into an alternate world where she finds herself turned into...a teenage girl! To regain her crown and return to Equestria, Twilight had to learn how to fit into this strange, new world and defeat Sunset Shimmer in a competition to become crowned Princess of the Fall Formal at Canterlot High. 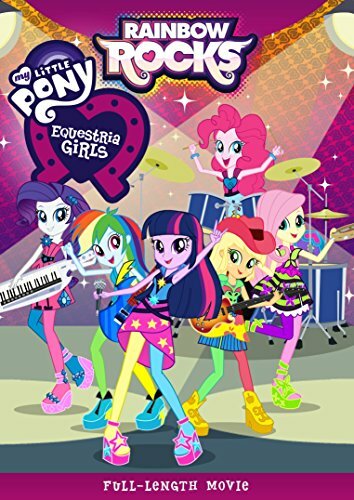 My Little Pony Equestria Girls: Rainbow Rocks is now available for pre-order at Amazon.com, ShoutFactory.com, Target.com, and Walmart.com, and will be in stores everywhere October 28. For more information on My Little Pony Equestria Girls: Rainbow Rocks , please visit www.mlpeg.com. Hasbro Studios is responsible for entertainment brand-driven storytelling for Hasbro across television, film, commercial productions and short-form content. It develops, produces and distributes TV shows based on Hasbro's world class brands, including TRANSFORMERS, MY LITTLE PONY, LITTLEST PET SHOP and FAMILY GAME NIGHT. Many of these shows air on Discovery Family Channel and on networks in more than 180 territories globally. Since its formation in 2009, the studio has received seven Daytime Emmy wins. On the film side, the studio has developed and produced a number of features based on Hasbro's brands. Upcoming films planned for release include Ouija (Universal), CANDY LAND (Sony), G.I. JOE 3 (Paramount), JEM AND THE HOLOGRAMS (Universal) and MAGIC: THE GATHERING (21st Century Fox).